La Orquesta Tradicional Fernandez Fierro en acción! If anyone told you Tango in Argentina is an old people’s hobby they were SO wrong! In the last 2 decades Tango had a great surge in popularity amongst the young people, both for dancers and musicians (pros and amateurs). This image of the Fernandez Fierro Ensamble in San Telmo can give you an idea of what is going on in terms of Tango in the city and what you can see on a Sunday in the San Telmo Flea Market. 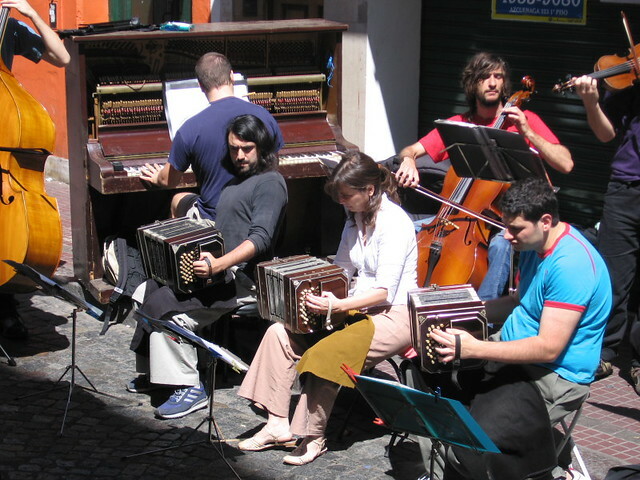 This entry was posted in Uncategorized and tagged bandoneón, fierro hotel, flea market, San Telmo, Street music, Tango by Fierro Hotel Staff. Bookmark the permalink.